Stars Wars is one of those IPs that is not a stranger in terms of game spin-offs. And with the premiere of Star Wars Episode VII last week, the IP has just gotten a new spark of life among a younger audience. So to bank on the Force Awakens hype, EA jumped into the spin-off market with Star Wars: Galaxy of Heroes. 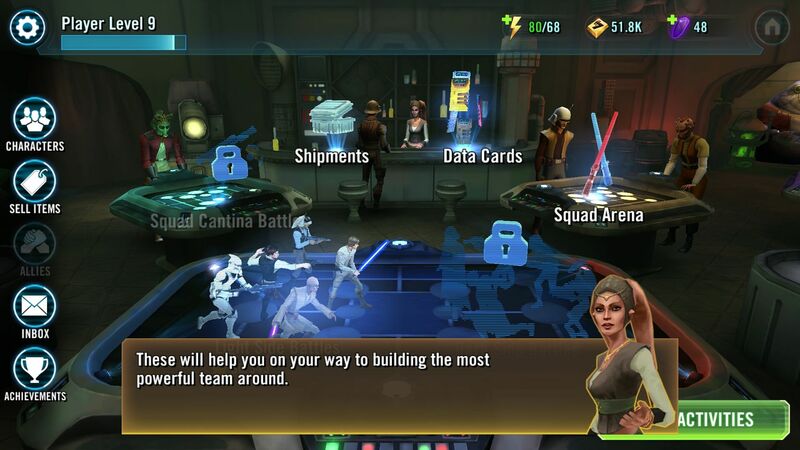 Star Wars: Galaxy of Heroes is a Squad based strategy game from EA Capital Games for the Android and iOS. You play as a fledgling holotable player starting off in your journey to master this very competitive pastime in the Star Wars universe. And as such, you will be in control of units from the various canon Star Wars TV show and movies. 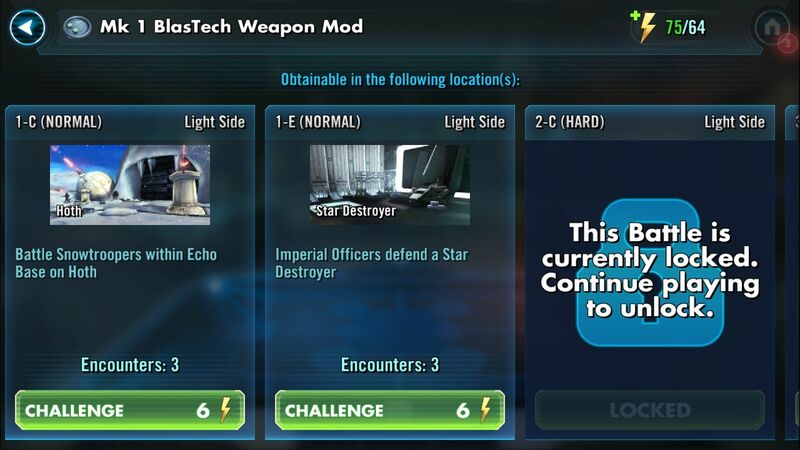 The core gameplay of Galaxy of Heroes is battle-centric, light and dark side instanced stages where you will be fighting against either the empire or rebel units in highly thematic stages. To clear a stage, you need to go through three different monster mobs. Galaxy of Heroes will then reward you with either one, two, or three star victories as you finish the stage without any casualty from your team. There is a clear divide between which heroes are for the light or the dark side of the force in Galaxy of Heroes. 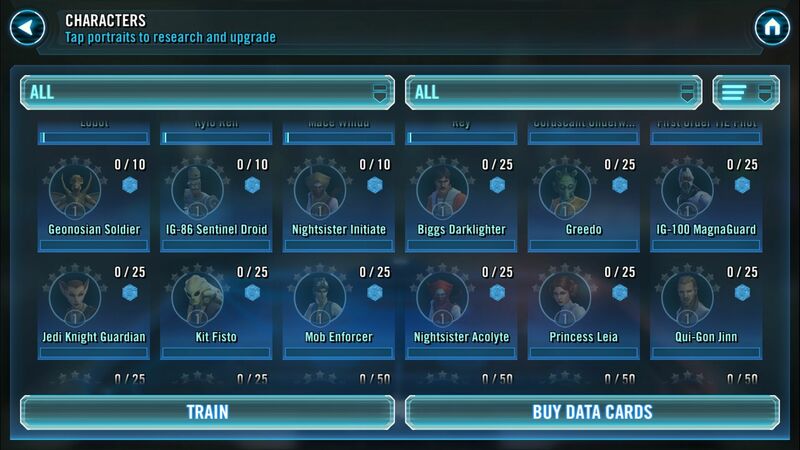 And so far, the game has a wide range of heroes you can unlock which came from the animated TV series Clone Wars and all of the existing Star Wars movies (yes even the Force Awakens). Typical to a lot of unit-based games available, you will be able to level up your crew overtime, improving the stats of your characters and increasing their passive and active skills. However, unlike the recent trend in mobile titles where you can just upgrade unit level by consistently use them, your units won’t earn experience as you finish a stage. You will be given experience pods where you will have to decide, between battles, which units will get priority in leveling. You can also improve your unit’s stats by equipping them with accessories and weapons. Galaxy of Heroes also includes an equipment tiering system in character development by doing so. As you fill all the equipment slots, you can then upgrade to a higher tier (and color) set of equipment. This way, you can also unlock new skills both passive and active as you go along. Another way to improve your character is to complete the collection of shards even after you already unlock the unit. Not only does this increase the unit’s rarity, but also significantly increases the unit’s overall stats. Galaxy of Heroes uses the active battle time system where each character has its own timer to determine if it’s their time to attack. You have a max cap of five units for your team. You have access to a targeting system, and, depending on the hero and their level, to the various attack types they can do. 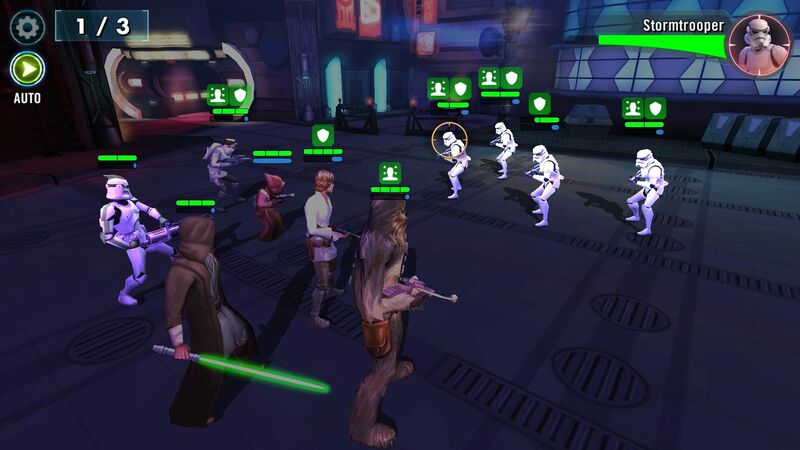 The single player PvE system consists of segregating your roster to light or dark side battles. 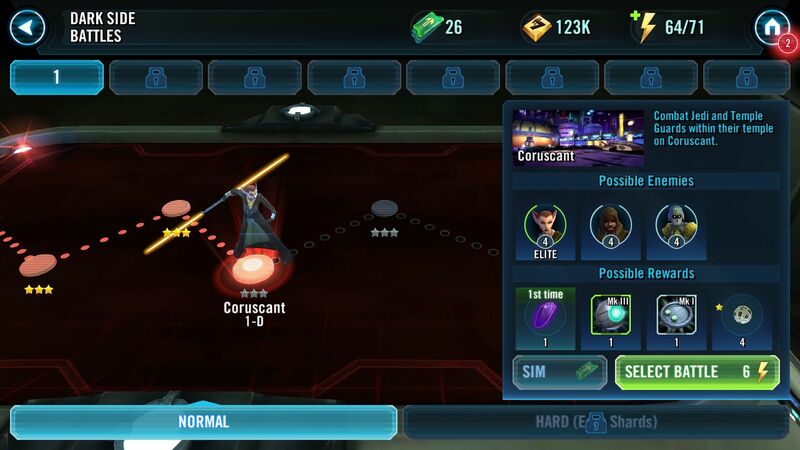 As I mentioned earlier, you will be facing against units from either the light side (if you are going through the dark side battles) or from the dark side (if you are going through the light side battles). The stages differ depending on the battle you choose from. But expect imperial bases like, Death Star, Endor and the like as your maps for dark side battles. On the other hand light side battles are rebel themed areas like the base in Hoth and Tatooine. Expect everything that you can experience in other squad-based unit PvP to be part of the features in Galaxy of Heroes. However, EA tries to shake things up a bit in some event challenges where you are required to use a specific unit type only to participate. Overall, my experience with Galaxy of Heroes has been enjoyable thus far. The game does offer a bit of decent fanservice features and gameplay to pander to their audience. Unfortunately more time was spent in pandering than innovating. 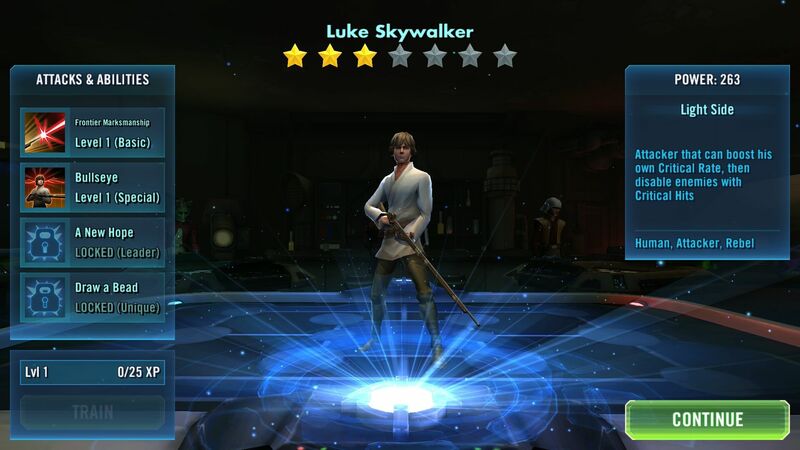 Galaxy of Heroes is just a Star Wars skin on existing games in the genre. If you don’t normally play mobile games and just jumped on board because Star Wars though, that shouldn’t be a problem. On the flipside, it’s nice to see some characters you don’t really get to see in games be included in the roster. Examples include Grand Moff Tarkin, Biggs Darklighter (where’s WEDGE?!) and even Lando Calrissian. But, even with the already extensive list of characters in the game, I would actually love to see some Star Wars Rebels characters included, like Ezra, Hera or even Chopper. But then I think they’ll just include it later on just like the TFA characters who are new additions to the roster. It’s nice to see that the game spans to other locales to bring homage to the older movies. I like the fact that you can get by and be competitive without spending a dime in the game if you are persistent enough. At first I thought that I would need to spend money for the specialized materials needed to upgrade your unit skills, but time-locked challenges make these mats accessible to all. 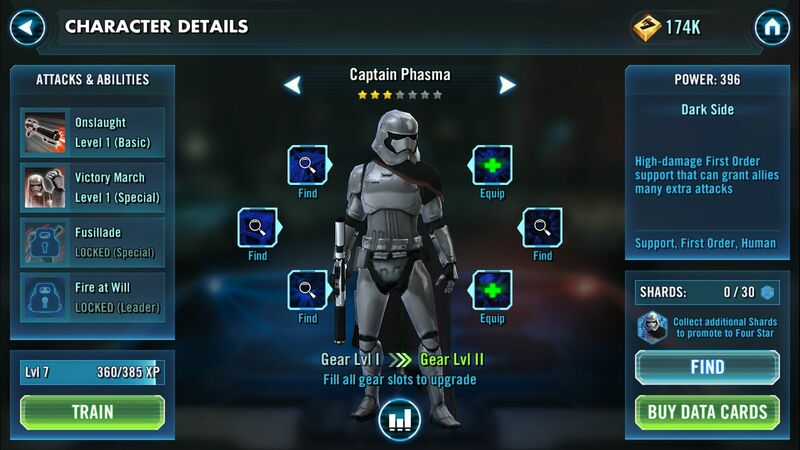 While not innovating on the genre, EA learned lessons from lesser titles to ensure there are enough unique type specific challenges to encourage players to level and experience a wide range of the roster. After a few weeks of playing, it feels good knowing you have a stable of heroes both diverse and powerful to face any challenge. However, the game does drag on a bit as you continue playing and reaching the latter stages of the game. It loses its appeal and becomes a drag as you hit the slower high level grind. That’s nothing new for this genre of mobile RPG, but at least Galaxy of Heroes hits the snooze cap point at a way later point than most. 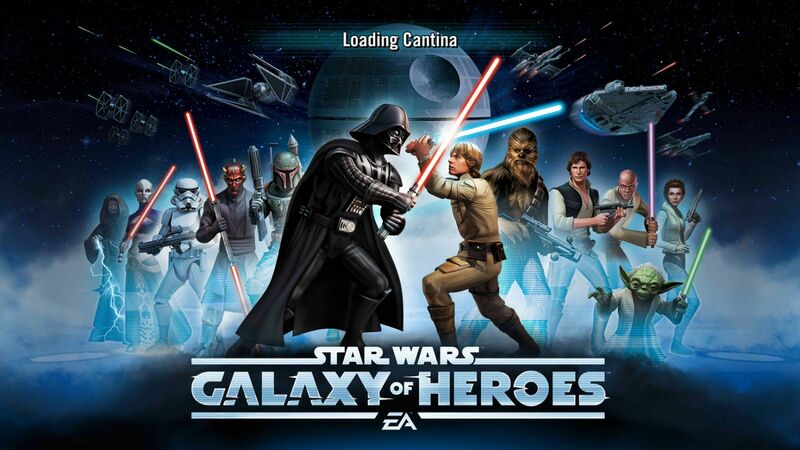 All in all, I can say that if you’re a Star Wars fan that’s looking to itch some SW gaming, utilizing heroes from throughout the now canon universe, Galaxy of Heroes will keep you entertained through the winter break and beyond!